Below is a graph of Computing on a logarithmic scale. It shows the power of computing at the Supercomputer, Desktop Computer and Mobile level. 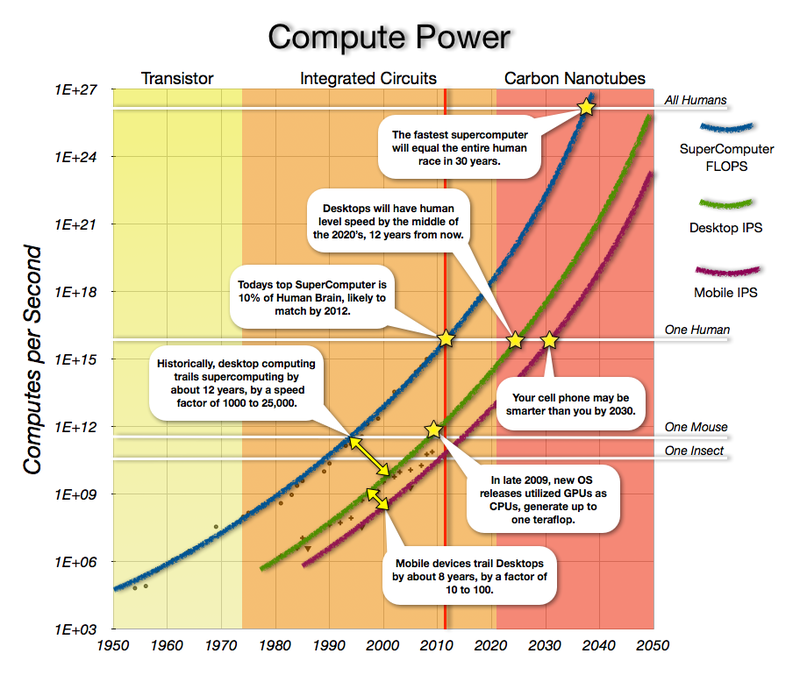 This is Moore’s Law in action – it states that the number of transistors doubles every 18 months. 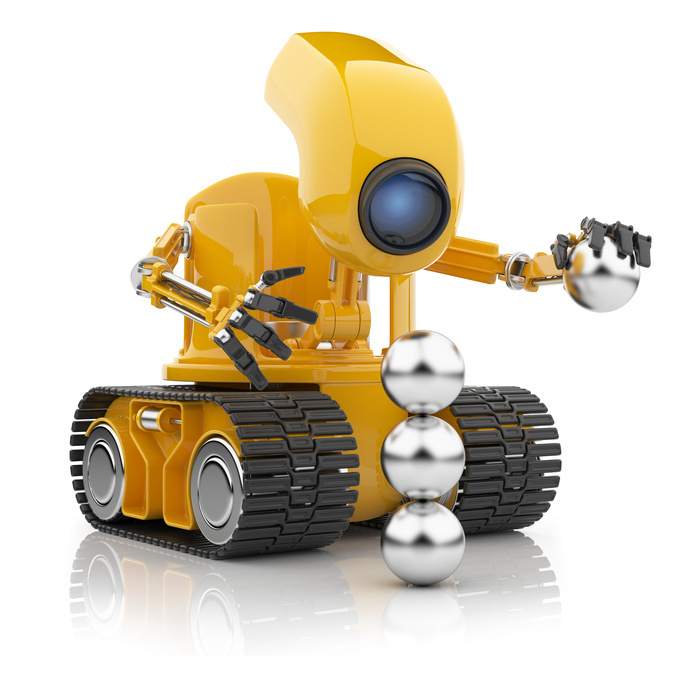 Computers are Turing machines, which means that they all work the same fundamental way – as a series of operations. Computing power is just a measure of operations or calculations per second. Both large or small computing power advances at a predictable rate. When we can measure technology state in the present and past, that gives us an exponential trend line. Forecasting forward, it is possible to predict computing’s future state and its implications. The implications are nothing short of profound. Very shortly (a year or so) the most powerful computer in the world will equate to the human brain for computing power. Its not human yet as it lacks enough storage, but its an important step. Another 100 fold improvement and we can simulate a human brain. Around 2023 – 2025 desktops/laptops will equal a mind. By 2030 the worlds most powerful supercomputer equates to almost a million humans. Note how your cell phone may be smarter and wittier than you by 2030. Original credit for this type of graph belongs to Ray Kurzweil in the Singularity is Near. In the previous graph, desktop computing improved in performance by 1,000 over the last 15 years while costs and size shrank. This enabled small supercomputers a decade ago to be in your laptop today. Likewise, computers also shrank in size by a factor of 100. That enabled tablets, smart phones and apps. All of these technologies are doubling every 8 months to 2 years. Thinking Exponentially, you’ll quickly realize that each will advance 100 to 100,000 fold next decade as they double 5 to 15 times. There is an important consequence to rapidly advancing technology. Computers will enable artificial intelligence far sooner than anyone thought possible. Large scale genetic sequencing will prove to be the Achilles heel of cancer. Synthetic life will go mainstream and revolutionizing entire industries. 3D printing will turn manufacturing on its head. Warfare will be fought with robots and drones. Dictatorships will fall as populations organize with mobile. Advanced Education will be made available freely to the world. Now that you know technology scales exponentially, what once seems impossible becomes quite possible. Quantum Machines, Robotics, and Brain to Computer interfaces are just the beginning. Thinking Exponentially with technology also has big applications in Business and Investing.